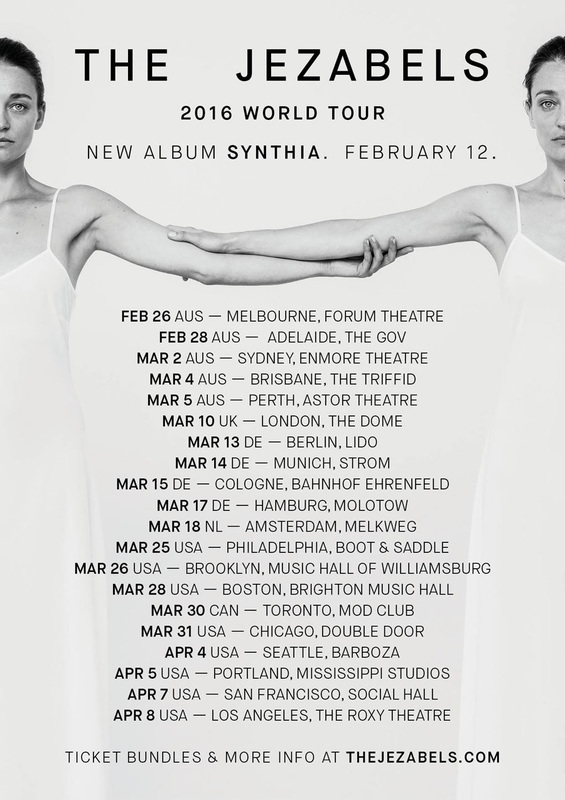 2016 sees The Jezabels return with their third studio LP, Synthia, released independently on Friday 12th February. After eighteen months off the road, writing and recording with long time producer Lachlan Mitchell, they are excited to announce a national, major cities tour, with special guest, twenty-one-year-old electro pop sensation Eves The Behaviour. High expectations are a given now for The Jezabels, seven years since those first EPs, The Man is Dead, She’s So Hard and Dark Storm began their slow burn from Sydney to the world; four years since Prisoner scooped the Australian Music Prize and set stages ablaze from their breakthrough performance at Splendour in the Grass to Lollapalooza, and almost two years since The Brink and the spectacular global onslaught that followed, with talked about live performance slots at Montreal Jazz Festival, Glastonbury, T in The Park, Deichbrand and more. Although the first official single from the new album isn’t due for release until early 2016, the band have released six-minute epic Come Alive online to give fans a taste of what’s to come. Synthia is available for iTunes pre-order now. Ticketing bundles are also available. Pre sale 2.00pm Tuesday 24th November.